So I’ve had Deborah Madison’s Local Flavors cookbook for about two years – around the time that we got really invested in buying and eating local – but in that time have only made ONE recipe from it. I’ve been trying to be better about buying cookbooks, but this seemed like one I’d really use, you know? Unlike Blue Eggs and Yellow Tomatoes and The Farm to Table Cookbook, both of which were lovely but didn’t reflect our eating habits or the foods actually available to us locally in Virginia. I suppose I can only spuriously say that I used the Local Flavors recipe for tonight’s dinner – a platter salad – for a variety of reasons. First, I only followed about half of the instructions. I didn’t boil or blanch in the right order, and owing to a moped emergency in the middle of prep, I also didn’t make Madison’s dressing. Also a recipe? For a very deconstructed salad? Helpful, but kind of overkill. In fact, the recipe was primarily useful for the gorgeous photo that I used to convince Shane that this was enough for dinner. Our own salad didn’t look much like Madison’s, but it was pretty spectacular if I do say so myself. Moving clockwise, we have brand new red potatoes from the market, boiled in salted water for about 20 minutes or until soft. Green beans from the market, safely kept away from Head Bean Eater Mina and blanched for about 7 minutes. Carrots, long lingering in our crisper, peeled and boiled for about 10 minutes. A sweet market onion, sliced into rounds and lightly pickled in red wine vinegar. Line-caught Bonito tuna, tossed with a bit of the red wine vinegar. And French breakfast radishes from our garden, all atop romaine lettuce from the market. And we ate all of it, well, except some of the lettuce. NB: Zingerman’s is having a crazy summer sale on a handful of excellent items. We’re REALLY irritated that we missed out on discounted fancy tuna, as we’ve just exhausted our stash. If you’re local, you can save yourself some extra dough by ordering over the phone and picking up your goodies in person at the warehouse south of town. Also hat tip to Sarah, who also cooked from Local Flavors tonight! CAPRICORN (Dec. 22-Jan. 19): What are the toughest pairs of opposites in your life, Capricorn? What are the polarities whose different sides rarely resonate with each other and too often threaten to split you in half? One of the distinguishing characteristics of 2010 is the fact that you are getting unprecedented chances to bring them together in ringing harmony, or at least a more interesting tension. What have you learned so far about how to work that magic? And how can you apply it in even craftier ways during the next six months? For our second go-round with this recipe, I made a few alterations – some improvements, others just alterations. Last time I drained and used a jar of whole tomatoes from last summer – we’ve since run out of tomatoes and didn’t pick up enough from the market, so I used a can of diced tomatoes in sauce. This made a big difference in the resulting quantity and consistency of the sauce. Second, we didn’t have any white wine around, and I didn’t want to buy and then open a bottle for a measly 1/4 cup. I made a dubious substitution, using the Pillar Box Red that has been open in the fridge for *cringe* almost two weeks. While iffy to drink, it was perfectly serviceable in the sauce – in fact, I think I preferred it to the white, which may have been overly sweet. Third, in an effort to use up pasta leftover from a potluck a few weeks ago, I used whole wheat angel hair instead of the fresh sheets of pasta that the recipe requests, or the wee shells we used last time. I quite liked the way the sauce coated the pasta, and the way the angel hair broke up amidst the beans and sausages, but Shane preferred the shells, so we’ll probably go back to them next time. I also made the whole recipe instead of halving it, remembering that we’d devoured every last bite. Had we not cleared the table and exercised some self control, I have no doubt that we could’ve put away the entire thing tonight. Fortunately, however, good sense prevailed, and I’m really looking forward to leftovers for lunch tomorrow. This recipe is definitely a keeper! Our garden has started to yield all kinds of lovely things – smallish beets and kale thinnings, a couple of potatoes, and lots of French breakfast radishes – and yesterday I spotted the first couple of tomatoes ripening on the vine. Somewhere I wrote down everything that we’re growing, but I keep planting more things each time I’m there, so I’m not sure how reliable those notes are anyway. That’s not the point, though – the point is that we are growing food! In our garden! I had a simple and really lovely lunch today – a small yellow 2nds tomato from the market and a few spicy radishes from our garden, all sliced thin and drizzled with a feta dressing and a sprinkle of sea salt. A couple of slices of toast. The last of the cold brew coffee. And then I read my book and took a nap, and it was good. Such is my love and devotion to my husband that I spent this morning making the house smell like weird meat so that he could have goetta for breakfast on Monday. What is goetta, you ask? That was my question as well when Shane and I first started dating and he would ask for it when we went out for breakfast. Wikipedia describes goetta as German peasant food. Like scrapple or hash, it’s meat, usually pork, cut with a filler to make it stretch out over more meals or servings. Goetta is made with pork and steel-cut oats, plus a variety of seasonings and occasionally beef. Goetta is pretty hard to find outside Cincinnati – you can mail-order it from Glier’s, but otherwise you’re pretty much on your own. We had a couple of pork chops in the fridge, and following an aha! moment earlier this week, I decided to try to make it at home, using a recipe from the Glier’s blog. First, you simmer your pork for about an hour, thus cooking the meat and making a pork broth. I didn’t take pictures of this step, so use your imagination. Using your food processor or grinder, grind your now-cooked pork, an onion, some garlic, and other seasonings together. Put all of this back in with the broth, then add steel-cut oats and stir until combined. Are you imagining a weird porridge right now? Because that’s what you’ve made. Pour the weird porridge into a loaf pan or baking pan and bake for about 90 minutes at 350F. You’ll want to stir it a couple of times, which will also let you check to see if it has set. The final consistency should resemble meatloaf. Perhaps you have noted that I haven’t given you the actual recipe. That’s because the goetta wasn’t very good. I mean, it had the right look and consistency, but when Shane fried it up for breakfast, he said it needed a LOT more pork and seasoning. So, a reasonable first attempt, but not a recipe we’ll be repeating. Sorry, Betty Reisen. 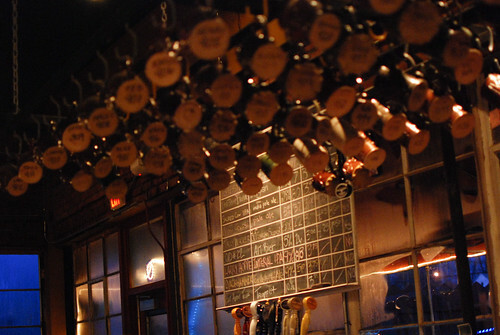 Lacking dinner plans, we again found ourselves going out tonight – this time to Corner Brewery, in Ypsilanti. 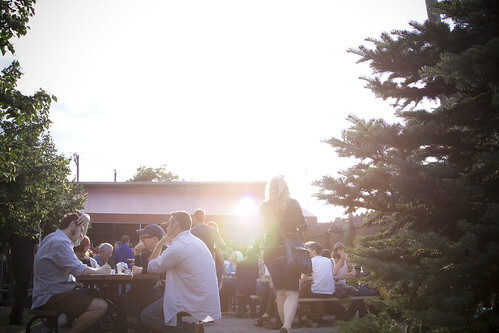 Located near the Depot Town area of Ypsi, Corner is a fair drive for us, but on a beautiful night like tonight, it’s well worth it for the patio and the beer. Corner is the sibling brewery of Arbor Brewing Company, which we’ve been to a fair number of times. I don’t know what it is about ABC, but we just haven’t found much to love about it. I like their food, but they charge exceptional prices for only adequate beer, thus providing a strong disincentive for choosing ABC over, say, Jolly Pumpkin. Corner, however, seems to charge pretty decent prices for pretty decent beer, which is good enough for me. Shane has said a couple of times that he’d consider joining their mug club if we lived in Ypsi (which might happen next year depending on the housing market). I was starving, so I had a portabella mushroom sandwich with a nicely savory tapenade and with quite well seasoned grilled vegetables on the side. It’s not that I don’t love chips, but if grilled squash is an option, I’ll take that 9 times out of 10. Shane was less hungry, so he snacked on chips and guacamole along with his Arborealis. I ordered a Strawberry Blonde, but am pretty sure I got the Brasserie Blonde – nice and malty, but lacking the strawberry sweetness. A nice night for sitting outside, and a nice dinner to go along with it. A couple of weeks ago, my library launched our new website – we also launched the new look on our catalog, wiki, FAQ, blog, and probably other places that I’ve forgotten in the crazy stress leading up to the launch. I inherited the design from my predecessor, and have spent the last few months beating the site and associated services into shape for this launch. And tonight we celebrated! 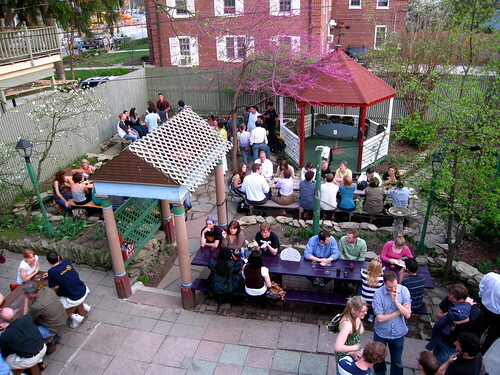 As far as campus bars go, Dominick’s is a real treat. This is no Kams or CO Daniels, where your shoes stick to the floor and where the sidewalks have to be hosed off every morning – weekdays included – to eradicate the smell of undergrad excess. Tucked away at the south end of Central Campus, just around the corner from both the B-School and the Law School, it seems to attract an older audience – more grad students and staff than undergrads – at least when I’ve been there. 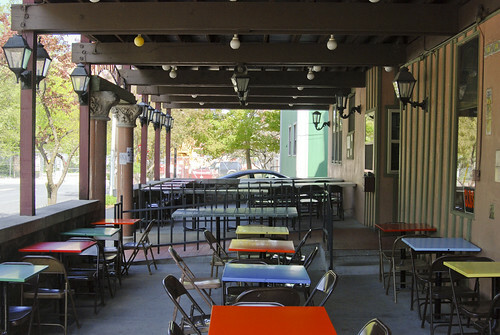 There’s a sheltered patio in front, and a lovely garden in back, and if you know you’re going to be there with a group, you can call ahead to reserve a table. Tonight we convened in the back garden, enjoying Mason jars full of sweet sangria or Founders pale. Shane and I split a totally adequate chicken quesadilla, far too large for just one person and packed full of vegetables and melty cheese. I coveted the slabs of garlic bread and bowls of pesto-coated pasta enjoyed by my coworkers – must remember this for another happy hour. For now, though, I am happy to have the site out the door, our awful versioning system rendered obsolete, and just enough sangria in my system to make weeding a pleasant task. Off to the garden!